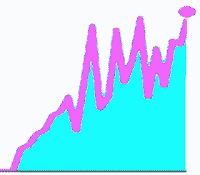 The site's total pageviews flew past the 250,000 mark. It is 254,133 as this post is being written. You may recall that the 200,000 plateau was reached in early June. Thank you all for your continued interest in and support of our work. Local Mafia boss John "Big Nose" Avena and associate Martin Feldstein were standing in front of 718 Washington Avenue in Philadelphia, a few paces from the intersection with East Passyunk Avenue, at about 2:20 in the afternoon, August 17, 1936. A small sedan approached on Washington. It slowed as it reached them. A gunman inside the vehicle pointed the muzzle of a submachine gun out a window and sprayed the two men with bullets. Avena appeared to be the gunman's target. He fell with numerous wounds to his chest. Feldstein, a minor numbers racketeer, merely picked a bad moment to stand on the sidewalk with the boss. He was struck by slugs in his arm and midsection. The sedan turned onto Passyunk and disappeared into the city traffic. Police later found the vehicle abandoned at 7th Street and Watkins, about a half mile from the scene of the shooting. Witnesses saw several men climb out of the car, one seemed to carry a piece of long luggage, and move off in different directions. Patrol officers and detectives in the area heard the gunshots and rushed to the corner of Washington and Passyunk. 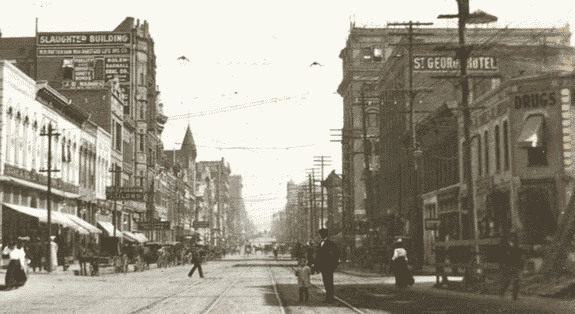 It was the southernmost intersection of a one-fifth mile of diagonal-running Passyunk that had been nicknamed "the Bloody Angle" because of the number of murders committed there. Avena and Feldstein were rushed to Pennsylvania Hospital. Avena was pronounced dead a few minutes later. Feldstein was rushed into emergency surgery. Surgeons extracted several slugs from his body, but the damage was extensive. Feldstein died that night. The coroner formally announced that Avena died of gunshot wounds to the chest and abdomen. Less formally, newspapers were told that Avena's heart was nearly blasted to pieces by a dozen well-placed slugs. Following the testimony of witnesses at an inquest, two men were named as suspects in the killing: John Fosco, alias John Martin, and Peter Gallo, alias Peter Wallace. 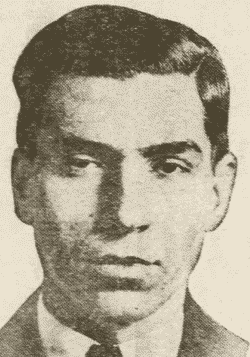 John Amato, chauffeur for gang leader Pius Lanzetti, was later named an accessory to the murder. Police investigators decided that the murder of Avena was the result of a feud between the Avena Mafia and a gang run by the Lanzetti brothers. 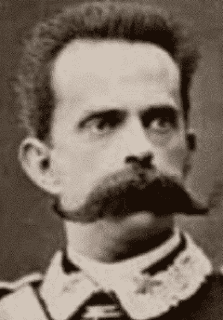 The groups had been quarreling over Avena's recent intrusions into Lanzetti numbers rackets. That Avena was deposed as Mafia leader through a drive-by shooting along the Bloody Angle was widely viewed as appropriate. He had first come to the attention of the public as a suspect in a similar shooting at the northern end of the angle about a decade earlier. Zanghi 'squeals' after brother's murder, Writers of Wrongs, May 30, 2017. 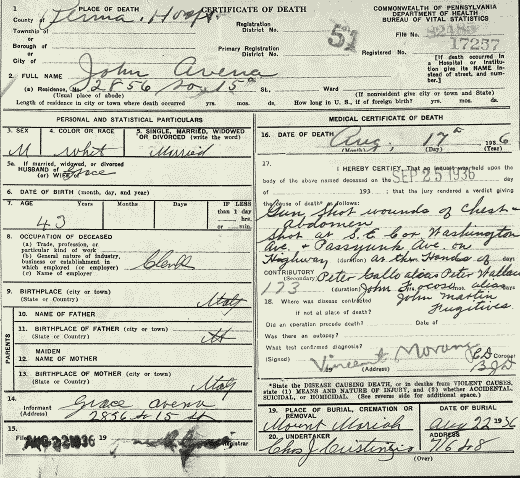 John Avena Certificate of Death, Commonwealth of Pennsylvania Department of Health Bureau of Vital Records, file no. 82485, registered no. 17257, Aug. 17, 1936. "Racketeer, aide killed in Phila. numbers war," Camden NJ Morning Post, Aug. 18, 1936, p. 1. "Suspect gives up in gang slaying; held as accessory," Philadelphia Inquirer, March 21, 1937, p. 2. "Two men slain by rivals in numbers war," Wilkes-Barre PA Evening News, Aug. 18, 1936, p. 9. McCullough, John M., "2 slain by gang in flareup of numbers war," Philadelphia Inquirer, Aug. 18, 1936, p. 1. What happened to girl wounded by stray bullet? When Mafia assassins opened fire in a crowded Manhattan intersection at midday, Aug. 11, 1922, they inflicted a mortal wound on their target but also wounded two bystanders. The intended victim, Umberto Valente, died an hour later at St. Mark's Hospital. A young girl and a municipal street cleaner - "collateral damage" in the hit - were rushed to Bellevue Hospital for treatment of gunshot wounds. Street cleaner Joseph Schepis, forty-two, suffered a wound to his throat that was not life-threatening. 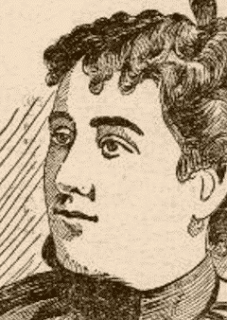 Eleven-year-old Agnes Egglinger, a visitor from Connecticut, was more seriously hurt. Newspapers in New York City and around the country told of Agnes being struck by a stray slug in the right chest. The New York Daily News, "New York's Picture Newspaper," ran a photograph of the girl. The papers said the young girl might lose her life. It appears, however, that no one in the media thought of following up to see whether Agnes survived. Public records indicate that she did. Federal and state census records show Agnes becoming an adult, and state records appear to show her marriage as well as her death. 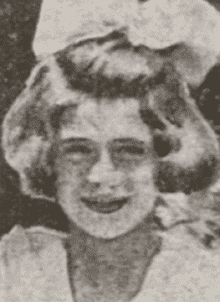 Agnes was the third child - and first daughter - born to Harry and Erna Schultz Egglinger of Jamaica, Queens, New York. At least two additional siblings were born after her. Harry worked as a metal lathe operator. 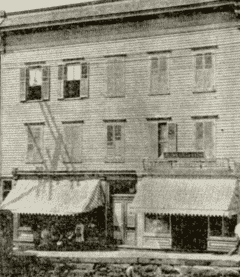 The Egglinger family moved in 1919 from Queens to New Haven, Connecticut, first settling at 34 Sylvan Avenue and later moving about a mile south to 42 Hurlbut Street. While in New Haven, Erna's younger brother Reinhold Schultz, Jr., - Agnes' Uncle Reinhold - lived with the family as a boarder. New York Daily News, Aug. 12, 1922. Scene of the attack on Valente. In early August of 1922, the Egglingers went to visit Erna's father, Reinhold Schultz, Sr., at his Manhattan home, 232 East Twelfth Street. They were a few days into their visit when a feud within the New York City Mafia erupted in gunfire at the intersection of East Twelfth Street and Second Avenue. Agnes and her four-year-old sister Dorothy were playing on the sidewalk, as gunmen loyal to Manhattan gang boss Giuseppe Masseria murdered Umberto Valente. Valente, a trusted assassin of Brooklyn-based Mafia boss of bosses Salvatore "Toto" D'Aquila, had failed in an assassination attempt against Masseria just three days earlier (a half-dozen striking garment workers were wounded - at least one fatally - when their group got in the way of the getaway car and mobsters fired at the ground to disperse them). Little Dorothy was fortunate to escape injury as the bullets flew on August 11; reports stated that a slug passed through the fabric of her dress. The media lost track of Agnes Egglinger after her arrival at Bellevue Hospital. But the 1925 New York State Census showed that Agnes was alive and living with her family at 12009 Baisley Avenue back in Jamaica, Queens. Sometime between the 1922 visit to Manhattan and the 1924 birth of Agnes' little brother Alfred, the family had returned to New York from New Haven, Connecticut. Agnes, eighteen, also appeared in the 1930 United States Census. She was still living with her parents, though their address had changed to 120-19 153rd Street, Queens. Harry Egglinger owned the home at that address. The census placed the home's value at $10,000 and noted that it was equipped with a radio. A decade later, eighteen years from the shooting that nearly cost Agnes her life, the 1940 U.S. Census found the twenty-eight-year-old in her parents' home on 153rd Street. Her two younger siblings were also still in the household, and an older brother was renting rooms in the house for himself, his wife and their young son. Agnes was working as a clerk in an insurance office. While available records are not definitive, it appears that the Agnes Egglinger who was accidentally shot in the summer of 1922 was the same Agnes Egglinger who became the wife of Frank Seelinger in Queens in late September of 1946. It could be argued that marriage was a greater threat to her health than a bullet. Records show that Agnes Seelinger died in July 1949 - twenty-seven years after the nearly fatal gunshot wound and less than three years after taking her wedding vows. "1 dead, 2 shot, as bootleggers again fight on East Side," Brooklyn Daily Eagle, Aug. 11, 1922, p. 1. "Bootleggers at war," Philadelphia Inquirer, Aug. 12, 1922, p. 2. "Cloakmaker, victim of gunman, dies; 3 more in hospital," Brooklyn Daily Eagle, Aug. 9, 1922, p. 20. "East Side bad man killed as shots fly," New York Herald, Aug. 12, 1922, p. 16. "Eight men shot in mysterious battle on street," Brooklyn Daily Eagle, Aug. 8, 1922, p. 1. "Gang kills gunman; 2 bystanders hit," New York Times, Aug. 12, 1922, p. 20. "Gunman's volley fatal to striker," New York Times, Aug. 10, 1922, p. 13. "Gunmen shoot six in East Side swarm," New York Times, Aug. 9, 1922, p. 1. "Man dies from bullet, girl is seriously hurt," New York Evening Telegram, Aug. 11, 1922, p. 1. "Mystery in rum street battle near solution," New York Tribune, Aug. 12, 1922, p. 16. "New Haven girl wounded in New York bootleggers' feud," Bridgeport CT Telegram, Aug. 12, 1922, p. 1. "One killed, two shot in pistol battle," Brooklyn Standard Union, Aug. 11, 1922, p. 1. "One man killed, two wounded, in gang war," New York Call, Aug. 12, 1922, p. 4. "Three shot down in crowd in East Side gang warfare," New York Evening World, Aug. 11, 1922, p. 1. "Valente's arrest balked by murder," New York Evening World, Aug. 12, 1922, p. 3. New York City Death Index, certificate no. 8666, July 3, 1949. New York City Marriage License Index, license no. 10522, Sept. 28, 1946. New York State Census of 1915, Queens County, Jamaica village, Assembly District 4, Election District 27, Ward 4. New York State Census of 1925, Queens County, Baisley Park village, Assembly District 4, Election District 36, Ward 4. United States Census of 1920, Connecticut, New Haven County, City of New Haven, Enumeration District 505. United States Census of 1930, New York State, Queens County, Baisley Park, Assembly District 4, Enumeration District 41-376. United States Census of 1940, New York State, Queens County, Enumeration District 41-1287B. Hunt, Thomas, "Live by the sword... Mafia assassin Umberto Valente killed in East Village shooting," Writers of Wrongs, Aug. 11, 2017. Warren Diamond, fifty-five-year-old Prohibition-Era gambling czar of Dallas, Texas, ended his own life at his Highland Park West home on August 10, 1932. Diamond had been a patient at St. Paul Hospital (formerly St. Paul Sanitarium, located at the western corner of Bryant Street and Hall Street). Early on the morning of Wednesday, August 10, he decided to leave the hospital. He called for a taxi and rode three and a half miles to 4224 Armstrong Parkway, the large home he shared with his wife Nellie. A surprised and uneasy Nellie greeted him at the door. Diamond brushed past her and proceeded to his upstairs bathroom. Knowing that her husband had been despondent over his health issues, Nellie quickly summoned George Foote, Diamond's longtime friend and business associate. A short time later, a gunshot was heard. Foote entered the bathroom and found Diamond dead of a bullet wound to the head. An automatic pistol was on the floor a couple of feet from Diamond's body. A coroner's investigation determined that Diamond committed suicide at about 8:45 a.m. Newspaper reports of his death referred to the gambling racketeer as a "sportsman and philanthropist" and as a former druggist. Later reports revealed that he suffered from an untreatable cancer of the prostate and his deteriorating condition drove him to suicide. Diamond's funeral was held on the morning of Friday, August 12. The Rev. Louis Harrington, pastor of the Church of the Blessed Sacrament, conducted the services. 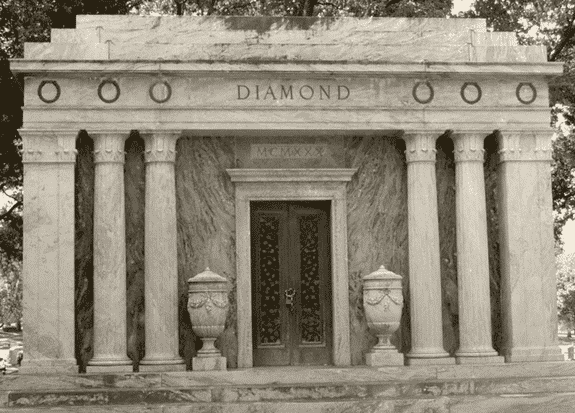 Diamond was interred in a family mausoleum he earlier constructed at the Grove Hill Cemetery. His pallbearers included two of his known lieutenants, F.L. "Dub" McClanahan and Ben Whitaker. Diamond's gambling empire, assembled over decades, was dismantled after his death. 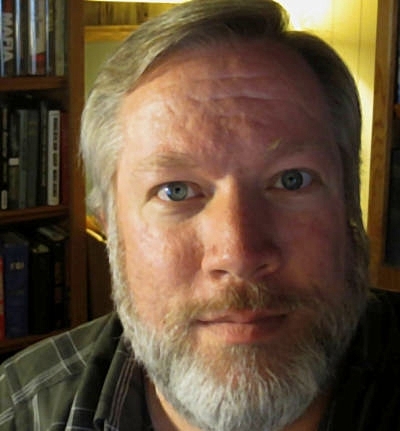 George Foote, his top aide, reportedly took over the Dallas-area policy (numbers) rackets. 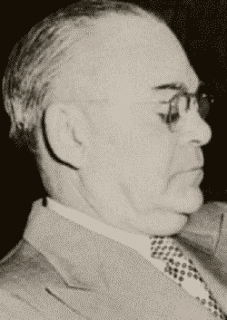 Ben Whitaker, who also dabbled in bootlegging, assumed control over the bookmakers and wire news service. Dub McClanahan took the popular no-limit craps games. Gambling operations within Diamond's old headquarters at the St. George Hotel, between Main Street and Commerce Street, were taken over by Dallas Mafioso Joseph Civello. Civello's operation, which included craps, bookmaking and a race wire service, was said to be under the protection of the local police department. Behind the scenes, a former Warren Diamond apprentice was scheming to take control of it all. 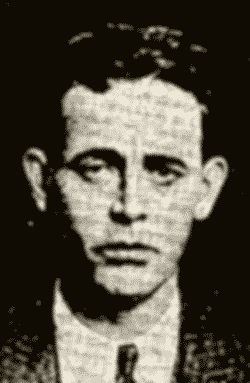 Benjamin "Benny" Binion reportedly broke away from the Diamond organization in the latter half of the 1920s and established his own organization at Dallas's Southland Hotel. His operation was said to be protected by Galveston-based mob boss Sam Maceo. Just a few years after Diamond's death, Binion was regarded as the top man in Dallas gambling. In 1936, he started to force independent bookmakers to make protection payments to him. 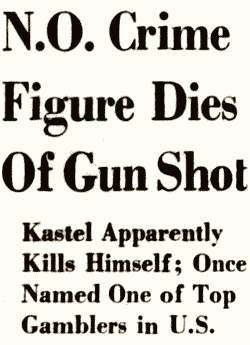 Control of policy rackets was nailed down with the fatal shooting of holdout independent operator Ben Frieden in September of that year. The St. George Hotel gaming rooms fell under his control when Joseph Civello was arrested on a federal narcotics charge (local police protection was little help). Years later, Civello was released from prison and pardoned after evidence surfaced that his own attorney and his trial judge conspired to remove him from the Dallas gambling scene through a narcotics frame-up. Political changes in the late 1940s made Dallas an unfriendly place for Benny Binion. He moved on to become a key figure in the growth of gambling casinos in Las Vegas, Nevada. Cartwright, Gary, "Benny and the boys," Texas Monthly, October 1991, p. 137. Edgerton, Harold J., "Joseph Francis Civello," FBI report, file no. 92-2824-137, NARA no. 124-10290-10440, May 17, 1968, p. 26-29. Kuykendall, Leo E., "Lester Benjamin Binion," FBI report, file no. 92-3241-7, NARA no. 124-90088-10054, Feb. 28, 1958, p. 11-12. Reid, Ed and Ovid Demaris, The Green Felt Jungle, Cutchogue NY: Buccaneer Books, 1963. 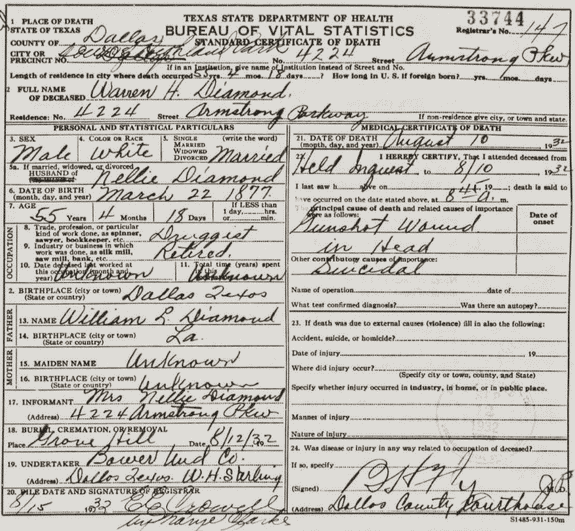 Death certificate of Warren H. Diamond, Texas State Department of Health, Bureau of Vital Statistics, certificate no. 33744, Aug. 1, 1932. John F. Worley Directory Co.'s Dallas City Directory 1925, Dallas: John F. Worley Directory Co., 1925, p. 866. Worley's Dallas City Directory 1929 Vol. XLII, Dallas: John F. Worley Directory Co., 1929, p. 361. Worley's Dallas City Directory 1932 Vol XLV, Dallas: John F. Worley Directory Co., 1932, p. 615. "Warren Diamond ends life after leaving hospital," Dallas Morning News, Aug. 11, 1932, p. 1. Funeral announcement, Dallas Morning News, Aug. 12, 1932. 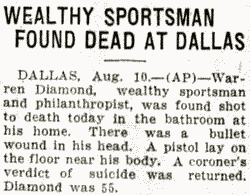 "Wealthy sportsman found dead at Dallas," Austin American Statesman, Aug. 10, 1932, p. 1. McCormick, Harry, "Crime in Texas III: Benny Binion Dallas' gift to racket ranks," Dallas Morning News, Feb. 13, 1951, p. 1.
to be a Pittsburgh Mafia boss. 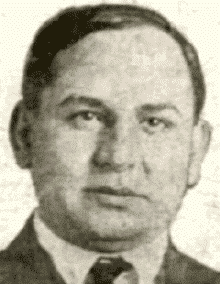 On that date in 1929, thirty-nine-year-old underworld chief Stefano Monastero was murdered as he went to visit an ailing henchman at St. John's General Hospital on Pittsburgh's North Side. 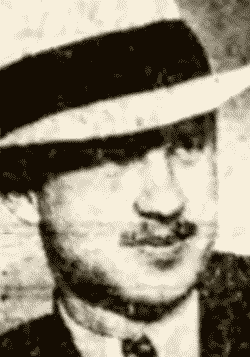 Calogero Spallino (also known as Sparlino), free on bail as he awaited trial for an attempt on the life of Monastero rival Joe "Ghost of the Hill" Pangallo, went into St. John's for appendix surgery. Stefano Monastero drove to the hospital in an armored automobile, featuring steel plating and three-quarter-inch bulletproof glass windows. But he had to leave the protection of the vehicle to enter the building. When he emerged, shotguns erupted from a nearby parked car. Monastero was knocked down by the shots. One of his assailants then approached with a handgun and fired into the boss's head to finish the job. The murder remained unsolved, but Joe Pangallo was generally believed responsible. Monastero's Mafia pedigree was noteworthy. 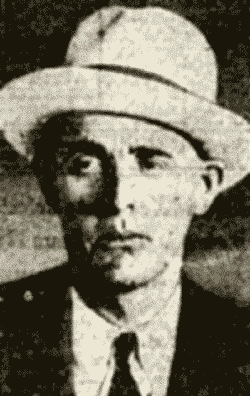 He was the son of Pietro Monastero, a Caccamo native who was among those charged with the 1890 Mafia murder of Police Chief David Hennessy in New Orleans. 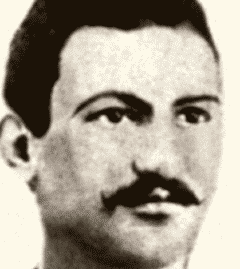 Stefano Monastero was very young, living with his mother and brothers in Sicily, when Pietro Monastero was killed by a lynch mob at Orleans Parish Prison in 1891. The family relocated to New Orleans following Pietro's killing and moved from city to city in the U.S. before settling in the Pittsburgh area. On the same date three years later, recently installed Pittsburgh boss John Bazzano was called to a meeting of the nation's Mafia leaders on Hicks Street in the Red Hook section of Brooklyn. He was to answer for his involvement in the recent murders of Wilmerding, Pennsylvania, racketeers John, James and Arthur Volpe. Bazzano did not leave the August 6, 1932, meeting alive. 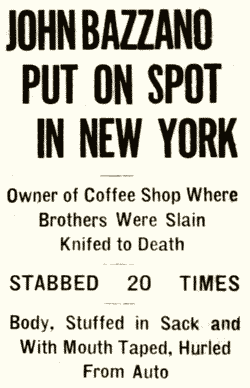 The Volpes, under the protection of New York underworld power Vito Genovese, were gunned down within Bazzano's Rome Coffee Shop on Pittsburgh's Wylie Avenue on July 29. 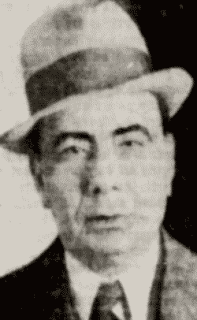 Genovese, suspecting that the Volpes were victims of an anti-Neapolitan conspiracy among Calabrian and Sicilian Mafiosi in Pittsburgh, New York and Cleveland (including Bazzano and Nick Gentile in Pittsburgh; Albert Anastasia, Joe Biondo and Vincenzo Mangano in New York; Frank Milano in Cleveland), assembled the disciplinary hearing for Bazzano. During the meeting, the forty-four-year-old Bazzano did not deny responsibility for the murders of the Volpes. Instead, he called on other Mafia leaders to join in a war to exterminate the Neapolitans in their organization. Bazzano's words and recent deeds presented a threat to the still-shaky underworld alliances that emerged from the bloody Castellammarese War concluded one year earlier. His punishment was immediate. He was gagged and tied with rope, while his body was punctured more than twenty times with ice picks. Some of the wounds reached his heart, causing a fatal hemorrhage. The body was found August 8, wrapped in burlap near the intersection of Centre and Clinton Streets in Red Hook. 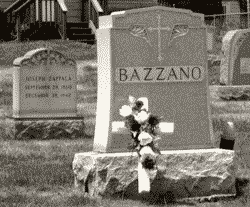 It could not be identified until relatives from Pittsburgh arrived in New York looking for Bazzano. 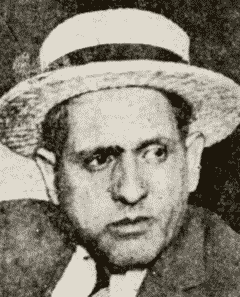 Authorities subsequently learned of an assembly of U.S. Mafiosi at New York City and rounded up fourteen underworld figures from Brooklyn (Albert Anastasia, John Oddo, Cassandro Bonasera, Ciro Gallo, Joseph Traina) and Buffalo, New York (Paul Palmeri, Salvatore DiCarlo); Pittsburgh (Calogero Spallino, Michael Bua, Michael Russo, Frank Adrano) and Pittston, Pennsylvania (Santo Volpe, Angelo Polizzi); Trenton, New Jersey (Peter Lombardo). The suspects, represented by attorney Samuel Leibowitz, were quickly released for lack of evidence. Hunt, Thomas, and Michael A. Tona, "A test of resolve," Informer: The History of American Crime and Law Enforcement, February 2011. Hunt, Thomas, and Michael A. Tona, DiCarlo: Buffalo's First Family of Crime - Vol. I, Lulu, August 2013. Hunt, Thomas, and Martha Macheca Sheldon, Deep Water: Joseph P. Macheca and the Birth of the American Mafia, Createspace, August 2010. Valin, Edmond, "Retired big shot provided FBI with glimpse inside Pittsburgh Mafia," The American Mafia, March 2018. 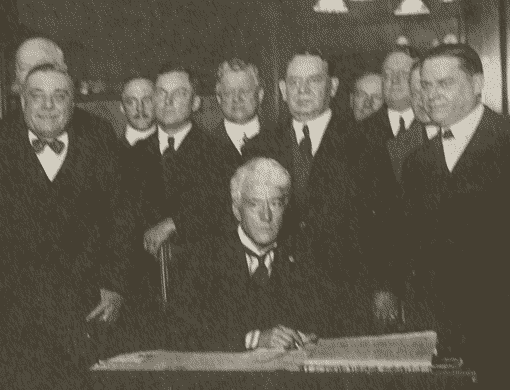 Baseball Commissioner Kenesaw Mountain Landis announced on August 3, 1921, that eight players involved in the "Black Sox" scandal would never again be permitted to play organized baseball. Regardless of the verdict of juries, no player that throws a ball game, no player that entertains proposals or promises to throw a game, no player that sits in a conference with a bunch of crooked players and gamblers, where the ways and means of throwing games are discussed, and dares no tell his club about, will ever play professional baseball. Landis, a veteran federal judge. had been given broad powers to protect the game when he was appointed baseball's first commissioner late in 1920. Major league ballclub owners feared at the time that the Black Sox scandal, just coming to light, would do permanent damage to the reputation of baseball. Though there had been rumors about the 1919 World Series being "fixed" through the influence of gamblers, the 1920 regular season was almost finished when grand jury investigation was launched. Charles Albert "Commy" Comiskey, president of the White Sox ballclub, suspended the seven suspects who were still on his team (Gandil was no longer with Chicago at the time). This action was taken despite the White Sox remaining in contention for the 1920 American League pennant. Eddie Cicotte appeared before the grand jury and admitted he was part of a conspiracy to throw the World Series in exchange for cash. Joe Jackson made a similar confession. Eight players were indicted for conspiracy in October 1920. They were placed on baseball's "ineligible list" for the 1921 season and went to trial that summer. By the time of the trial, the Cicotte and Jackson confessions were missing, and the players were denying any cooperation with gamblers.